Do basic research among your friends. Ask, "Are you happy and satisfied with your work?" If someone answers "no," and a lot of people will do that, you may already be facing a plan B. It is quite possible that he already has some project in the making: a book sketch in the drawer, a bench Carpenter's room in the maid's room, where she makes wooden houses, or a massage stretcher where she caters to rare clients. However, it is likely that our hypothetical interviewee is still a bit confused. Do not know if the problem is to change jobs (sometimes solve), change profession (there the twist is more serious), reinvent his life (more complicated still) or simply if just jumping paraglide in the open hours already gives the message . We have another very common type that says "no": The successful one. 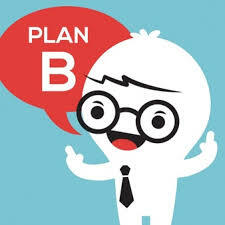 For our character, the existence of Plan B is not motivated by a career failure. Quite the opposite. Our interviewee is a competent professional with a vast collection of specialization courses, earns enough money, is recognized by his peers, and may even be modestly famous for his lectures. It is not for more profit or prestige that he wants to change his life, but because he works insanely, he stays late in the company and can not be close to his family. It may be that our friend does not even need a B plan: a course on how to better manage time, or a therapy that encourages you to say "no" may already be enough to solve your case. Only he does not know it yet. So, How can we be sure that our plan B can actually someday turn flat? And that this so cherished dream is going to give way? To know these and other answers, there is no way: you will have to read the whole report. Good reading. One of the roles of a career coach is to draw from you your own answers and conclusions. If you are not happy with your work or life, this has to do with what? With your expectations? Your dreams? Your fantasies? Your concepts? Does your idea of ​​how something should or should not be? Anyway, the career coach, as well as coaching, has a bottomless bag of questions at hand. They do this so that you get to the bottom of yourself. Only in this way is it possible to reach the heart of the question: why do you want to change? But a career coach also knows the market well, The new professions that are emerging, the ones that will disappear and how you can best sell your skills when looking for a job, for example. That is, you can also point out some ways or encourage your client to do this. Adriana Gomes is a career coach. To achieve this, she underwent an intense process of change. Graduated and graduated in psychology, and ready to accompany the human being in the process of developing her psyche, in the course of her life she went to work in a competitive headhunter agency, professionals who hunt the best executives of the market for the companies that are their clients . There, she unleashed. Not quite in the direction I wanted, that's true. To his misfortune, his great talent in the company was precisely in the area of ​​business. And so, from office to office, Adriana came to the vice presidency. She did not hate what she was doing: it was simply not her life project. "I wanted to be in touch with people, to know them, to help them, and not to draw plans and strategies for the company to make more profit," he says. Questions about their suitability for the profession, lack or excess of sleep, difficulty going to work ... "Therefore , pay attention to what the specialist suggests. If there are symptoms of dissatisfaction, it is necessary to analyze the reason quickly." Question is career change. I attended a lawyer who wondered if she was really capable of exercising her profession because her boss constantly humiliated her in front of everyone. Her problem was not with her career, she had the aptitude for it. What she needed to do was to change jobs, "says Adriana, who today helps people in her office, teaches, coordinates graduate courses at the School of Advertising and Marketing of São Paulo and has, under her Direction, a website, Life and Career. The subject of professional change seemed so complex and rich for Adriana that she decided to go deeper into the subject. She wrote a doctoral thesis that turned out to be a very successful book: Career Change and Identity Transformation (LCTE Editora). In it, she analyzes how identity is changing over time and how the profession can or does not follow these changes. Someone may want to be a doctor or engineer for a part of life and then change enough as a person to the point of not wanting to know more about it. Let's crucify the guy? No. There's another way you can take this story. But then how do you know, for example, if an entrepreneur who has always dreamed of being a photographer should abandon his career and choose another course in life? "He has to research more deeply about his choice.That is, To assess whether this is only a dream, whether it is a project with real possibility, and whether this desire arouses such a deep interest as to justify a radical change. In other words, it is necessary to base his plan B on a real basis. In this example, it is essential to know more closely the life and work of other photographers, to see what branch of photography he would like to do, how much he could gain, if he is capable of With the instability of the market. "In summary: ask, research, investigate and, if appropriate, draw your change plan from stage to stage," says the expert. The ideal is that this transition is gradual, gradual, often living with the profession or work that will be abandoned for a long time. Another alternative is to make photography a hobby that the businessman can devote a lot of time, softening his life full of commitments. In short: Whether it is a career change, a radical transformation or hobby, the response to a project depends on each case. But it is good to know that there are these gradations, and that it is not worth exchanging for each other. So, moaning, Plan B has to be anchored in reality. It can not be fluid, subjective, much dream of a summer night. That is, in addition to being very fond of this project, it is necessary to have the competence to carry it out and to be able to do it, whether with specialization courses, good information or research. If the plan is to have an inn (ah, the dream of the inn on the beach ...), it is necessary to know at what point the coast, the necessary capital, Competition in the industry and all those boring demands of the genre. More than anything, you need to ask yourself if you really have the profile to be a beachfront hotel owner, which includes commanding unqualified employees, withstanding guest complaints, checking for cleanliness and bedding, dealing with few suppliers Professionals, know how to tighten the belt out of the season. It is necessary to throw a bucket of very cold water before throwing a face in the plane B. Then we see what is left over. If even the sea view, the slower pace of life and bird song are more important than the rest, chances are good that your B plan works. Your heart is attuned to it. Sincerity? I, for one, prefer to pay to stay. You need to ask yourself if you really have the profile to own a hotel by the sea, which includes commanding unqualified employees, withstanding guest complaints, checking for cleanliness and bedding, dealing with few professional vendors, Belt out of season. It is necessary to throw a bucket of very cold water before throwing a face in the plane B. Then we see what is left over. If even the sea view, the slower pace of life and bird song are more important than the rest, chances are good that your B plan works. Your heart is attuned to it. Sincerity? I, for one, prefer to pay to stay. You need to ask yourself if you really have the profile to own a hotel by the sea, which includes commanding unqualified employees, withstanding guest complaints, checking for cleanliness and bedding, dealing with few professional vendors, Belt out of season. It is necessary to throw a bucket of very cold water before throwing a face in the plane B. Then we see what is left over. If even the sea view, the slower pace of life and bird song are more important than the rest, chances are good that your B plan works. Your heart is attuned to it. Sincerity? I, for one, prefer to pay to stay. Check cleaning and bedding, deal with few professional suppliers, know how to tighten your belt out of season. It is necessary to throw a bucket of very cold water before throwing a face in the plane B. Then we see what is left over. If even the sea view, the slower pace of life and bird song are more important than the rest, chances are good that your B plan works. Your heart is attuned to it. Sincerity? I, for one, prefer to pay to stay. Check cleaning and bedding, deal with few professional suppliers, know how to tighten your belt out of season. It is necessary to throw a bucket of very cold water before throwing a face in the plane B. Then we see what is left over. If even the sea view, the slower pace of life and bird song are more important than the rest, chances are good that your B plan works. Your heart is attuned to it. Sincerity? I, for one, prefer to pay to stay. The slower pace of life and bird singing are more important than the rest, chances are good that your B plan works. Your heart is attuned to it. Sincerity? I, for one, prefer to pay to stay. The slower pace of life and bird singing are more important than the rest, chances are good that your B plan works. Your heart is attuned to it. Sincerity? I, for one, prefer to pay to stay. By itself, it's already a case, as advertisers and business managers like to talk. Let's start at the end and tell what this young man does today. In the short time I was with him, Sérgio Franco finalized the details of the project of a mall (a mall outdoors) totally sustainable dedicated to extreme sports near Campinas. It is a place for ziplining in secluded woods, swimming pools with deep dives, sports equipment stores, small aircraft park, 4x4 pickup trucks and other incredible wonders. Sérgio also began to discuss with his partners the next Adventure Sports Fair, a fair held at the Pavilion of the Biennial, in São Paulo. All this in the midst of video projects, books and other activities related to the theme "adventure". If someone visited Sérgio about 15 years ago, Would find a good marketing entrepreneur involved in the circuit of the meshes of cities in the interior of São Paulo. He made money from it, brought social development to a region with few resources, which gave him personal gratification, but he still kept that little scratch in his chest that told him that was not what he wanted to do in life. "And when you open up to other possibilities, the synchronicities begin to appear, pointing the new direction," he says, convinced. In his case, it was the desire to build a hotel in his city, along with his brother about to retire, which was manifested as the first sign of change. "I was born near the river's edge, I had a childhood with nature, and I wanted a place that would bring that contact back to the people," he recalls. Sustainable, The hotel has access ramps and special zip lines for disabled and elderly, organic garden and a thousand other inclusion features. Sergio was approaching the universe of extreme sports and saw that there was a whole new world there to explore. When he decided to work with it, enthusiasm and joy began to return to his heart. "The idea of ​​setting up the Adventure Sports Fair came in a simple way: I gathered all the top athletes from each area to say what each one saw that could happen at a fair dedicated to this," says Sergio, who adopted a management model With partnerships, since it did not dominate deeply any of the subjects. His well-known generosity and openness in this medium of adventurers and sportsmen agglutinated people, companies and associates. But he warns: "Everything has a risk. Shooting involves losses and risky jumps. The initiative could have been a huge failure, but there was so much love and passion in the people that it was impossible not to work out, "he says.He himself became a pilot." There is an aviation maneuver called Estol. To get the briefly, you need to master it. It consists of steering the plane vertically upwards and up until the plane shakes and can not withstand the ascent. Then it falls vertically. And it goes down until you can master it again and put it horizontally to win a quiet flight. "Sérgio Franco says that in order to embrace Plan B, we sometimes have to have the courage to face the internal stall. It seems like everything is going to get out of control. But you have to stay calm and know that it is still possible to return to direction. We know in advance how the maneuver will be. We will feel the thrill of going through it, but we know rationally what will happen and what needs to be done to overcome this moment. "Finally, the risk exists, but it can be calculated in advance. To have the capacity to arouse passion, enthusiasm, joy, and to infect people who are helping to achieve it, and a great deal of courage and a certain amount of risk is required. Now we will visit Marcos Adriano Infantozzi some 20 years ago. He was the manager of an investment portfolio of a sophisticated French bank. The customers were satisfied with that competent, intelligent and good-humored young man. But there was a problem: he could not take his job any more. He wanted to change, and a call to healing and therapy dwelt in his heart. The story was getting unbearable when he received the invitation to attend a New Year's Eve party called Meeting with the Angels. Random couples were formed during the event, and he was chosen to accompany the housekeeper, a therapist who turned out to be the "godmother" of his change process. "I did a few sessions with her to know what course to take, what to do to have the courage to leave the bank and where I could direct my life." These were key moments for him. "A 'godmother' or 'godfather' who helps in this process is very important," acknowledges Marcos. You can be a therapist, a wise friend. "As I was already changing, everything around me started to change as well." I received a scholarship to study in the United States for a year, and I asked the bank for two sabbatical years - and I won. Take courses to direct me to therapy and the coordination of spiritual groups, which is what I wanted to do. " The money he earned from the investment bank was used to buy some real estate that made him quieter with finances. Thus, he has fresh head to devote himself entirely to his area. He became a representative of the book Course in Miracles in Brazil, Gives guidance and consultations to those who also want to change their lives or career and now attends a space in Vila Madalena, in São Paulo. He is another who has a smile from ear to ear when talking about his life. "Each one has a special task in this world, a work or a parallel activity that will fill his soul. We must learn to listen to the heart to recognize it and to follow that call." Marcos Adriano today helps many people to identify their dream and to realize it. And he has the court of whoever went through that. situation more clearly," Ana says. The help of "padrinhos" also helped her a lot. In this case, his parents were fundamental. As well as a friend who had also gone through the process of change and a good therapist. "Every time I sank trying to find new directions, they encouraged me. It was very comforting to have that support." To mitigate her expenses during the transition, she returned to her parents' house and set up her small office there. His big dream: to dedicate himself to making documentaries for the movies, which, admittedly, is not an easy decision to make. "I'm a natural storyteller, and I want to talk about lives that encourage people to pursue their dreams," she says. One of his current projects is to document the history of the National Air Mail, the adventure that was to break the air in the interior of Brazil and bring hope and help to isolated communities. Her enthusiasm is such that she has conquered the former Air Mail participants, now in their 80s and 90s, and even earned the title of honorary member of the national Air Force. There are still the sponsors needed to finish the project, and she's not afraid to go looking for them door-to-door. When the belt tightens too much, she makes a frill as a producer in an advertising agency and plays forward. Ana is still in the process. You have no prizes or achievements to present in relation to your B plan. Sometimes you fade away, sometimes you take strides. But he does not abandon his project at all. And, in a simple way, who knows his courageous example can enliven the will to realize the dream that exists right there in his heart. Now in his 80s and 90s, and even earned the title of honorary member of the national Air Force. There are still the sponsors needed to finish the project, and she's not afraid to go looking for them door-to-door. When the belt tightens too much, she makes a frill as a producer in an advertising agency and plays forward. Ana is still in the process. You have no prizes or achievements to present in relation to your B plan. Sometimes you fade away, sometimes you take strides. But he does not abandon his project at all. And, in a simple way, who knows his courageous example can enliven the will to realize the dream that exists right there in his heart. Now in his 80s and 90s, and even earned the title of honorary member of the National Air Force. There are still the sponsors needed to finish the project, and she's not afraid to go looking for them door-to-door. When the belt tightens too much, she makes a frill as a producer in an advertising agency and plays forward. Ana is still in the process. You have no prizes or achievements to present in relation to your B plan. Sometimes you fade away, sometimes you take strides. But he does not abandon his project at all. And, in a simple way, who knows his courageous example can enliven the will to realize the dream that exists right there in his heart. And she is not afraid to go looking for them door to door. When the belt tightens too much, she makes a frill as a producer in an advertising agency and plays forward. Ana is still in the process. You have no prizes or achievements to present in relation to your B plan. Sometimes you fade away, sometimes you take strides. But he does not abandon his project at all. And, in a simple way, who knows your courageous example can enliven the will to realize the dream that exists right there inside your heart. And she is not afraid to go looking for them door to door. When the belt tightens too much, she makes a frill as a producer in an advertising agency and plays forward. Ana is still in the process. You have no prizes or achievements to present in relation to your B plan. Sometimes you fade away, sometimes you take strides. But he does not abandon his project at all. And, in a simple way, who knows his courageous example can enliven the will to realize the dream that exists right there in his heart. But he does not abandon his project at all. And, in a simple way, who knows his courageous example can enliven the will to realize the dream that exists right there in his heart. But he does not abandon his project at all. And, in a simple way, who knows his courageous example can enliven the will to realize the dream that exists right there in his heart.